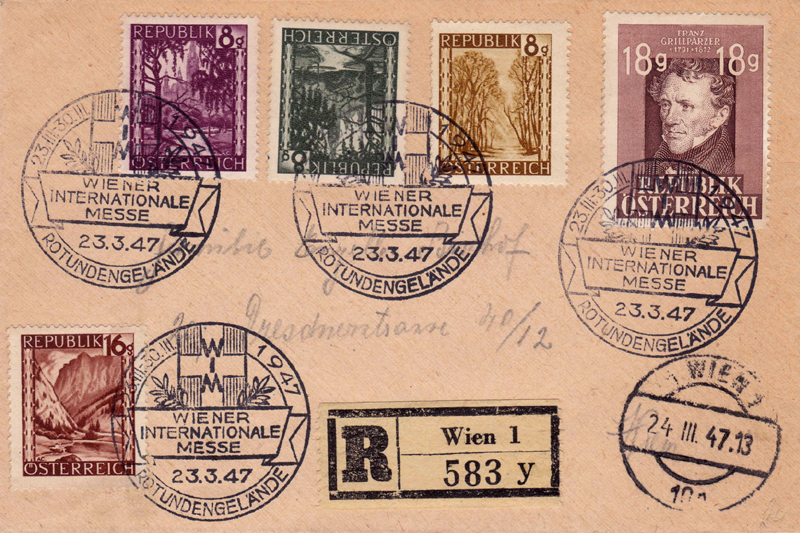 A set of eight stamps was issued on 23 March 1947 for the Vienna Fair, which was held from 23 to 30 March that year. The intention of the set was to publicise the productive capacity of Austria, so each stamp depicted some aspect of Austrian industry. They were all designed by Heinrich Blechner, who was born in Vienna on 7 March 1895 and trained as an engineer; after 1918 he became an industrial artist. The authorising decree [1947 Post- und Telegraphenverordnungsblatt Nr 7 item I.31] gives many details, and an appendix of the Official Description. An interesting contemporary article about the Vienna Fair itself follows the examples. 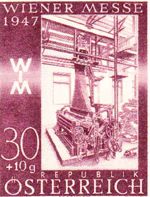 The stamps were printed at the Austrian State Printing Works on ‘ordinary white stamp paper’ in sheets of 50. The set is numbered 811-818 in the ANK catalogue and 1009-1016 in Stanley Gibbons. The stamps are recess-printed and comb perforated; ANK give the perf as 14¼:13½ ; SG has 14x13½; and the authorising decree says 14¼:13¾. Officially, 1 million sets were produced, and sold only as complete sets. They were valid for postage from 8am on 24 March 1947 until 31 July 1947. 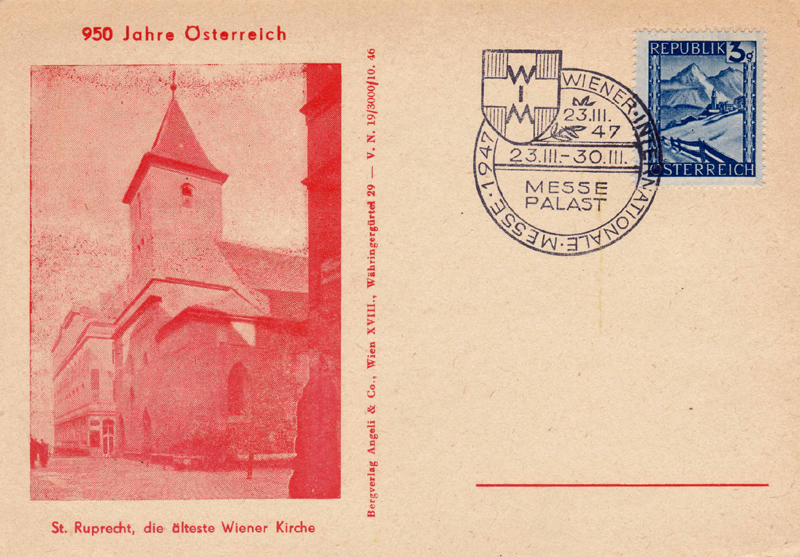 There is a plate error on the 46th stamp of the 30+10 stamp – a light spot under the ÖST of Österreich. 500 sets of blackprints were also produced. Unsurprisingly, expensive oddities are found including the 12+8 with no perfs; all values line perforated 14; and all values in unissued colours. The normal stamps are worth next-to-nothing loose, and from 25 to 60 Euro on cover (probably only if ‘Bedarfsbrief’, ie the correct franking on a contemporary item). 3+2 In the background is an old-fashioned threshing machine driven by a steam engine. In the foreground a Marchfeld peasant carts the sheaves on a long four-wheeled wagon with high sides, a typical central European arrangement. 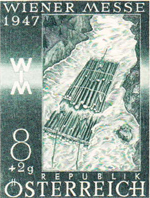 8+2 Timber is transported in rafts from the high forests down the fast-flowing Salzach river to the saw mills. In 1947 half the timber produced in Austria had to be used as fuel. 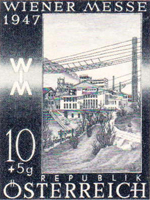 10+5 A cement factory with its complex of power lines and transportation systems symbolises the importance of this material in the post-war reconstruction. 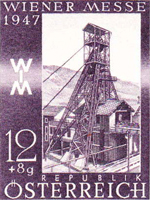 12+8 The winding gear and offices of the "Upper Styrian Lignite Coal Works" are shown. 18+12 The Zisterdorf (near Vienna) oil wells are shown; significant quantities of oil are found at several places in Austria. 30+10 A Jacquard weaving loom shows the importance to the economy of the textile industry, which is located near Vienna, near Linz, and in the Vorarlberg. 35+15 A blast furnace for the production of pig iron is shown. It is located in Upper Styria, probably at the Österreichisch-Alpine Montangesellschaft at Donauwitz. 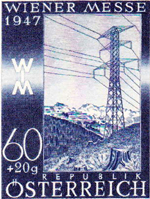 60+20 This stamp shows a high voltage pylon at the iron ore mine at Eisenertz in Styria; the terraces of the "ore mountain" are in the background. 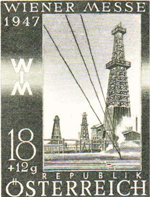 Electricity reached the Erzberg in 1911 and has been a major factor in its development ever since. As was normal, each registered subscriber had his standing-order number of set(s) sent to the post office from which he collected his orders. He had to accept and pay for them, at 2S50 per set. He had the option (but not the compulsion) to purchase at 10g a 2-page dissertation on the issue by Dr Hans Ankwicz-Kleehoven. These stamps could not be handed back to a post office in exchange for cash. The surcharge had no postal validity; from the total surcharge the production costs were deducted plus 10% for the Post & Telegraph Welfare Fund and the balance was given to Wiener Messe Aktiengesellschaft to help pay for the event. At the exhibition, both of the venues had a special post office where anyone with an identity document of almost any type could purchase one set of the stamps. Four different special cancels are listed by Wurth (his 1947-2, 3, 4, 5). Wurth 4 & 5. 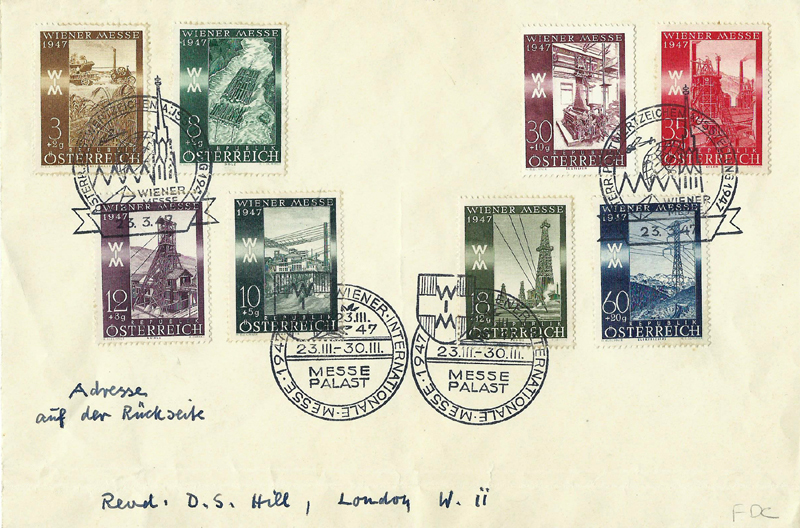 The franking is grossly excessive and the item philatelic – but the cancels are nice! Wurth 2. Probably a notional franking to pay for the cancellation! at the time so was perhaps added to fill the space prettily. 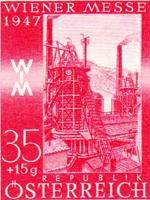 Wurth 5, on a full set of the special stamps. 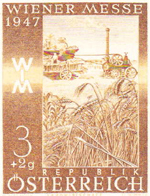 Wurth 2, on a set of the special stamps. Full London postal address on reverse, although no transit or arrival cancels – so was it posted or handed-back? This article appeared in the 15 March 15 1947 issue of the Postmarke, which magazine was restarted by Rudolf Fürst in May 1946 and ended as far as we know in March 1948. A translation from page 71 follows. 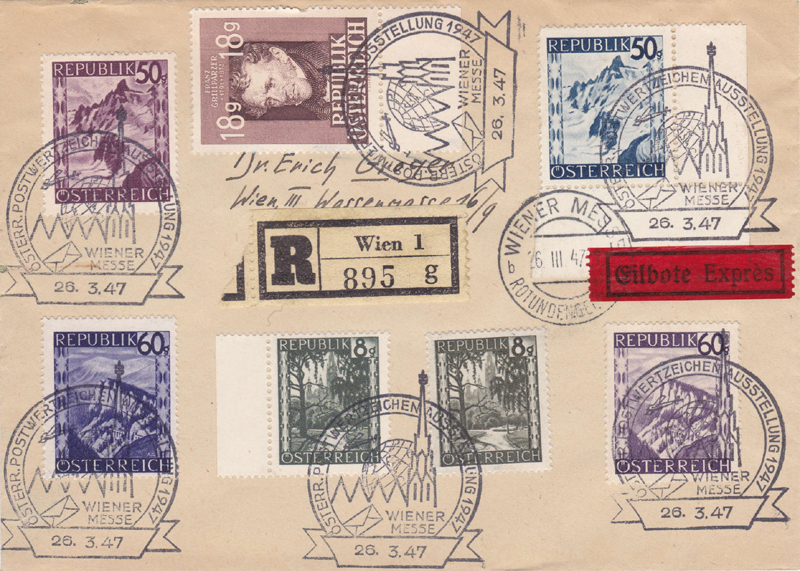 A collective show by the Austrian stamp dealers Association takes place from the 23rd to the 30th March 1947 in the Messepalast. It calls itself an Ö.P.A. (österreichische Postwertzeichen-Ausstellung). For the first time, the artistic designs submitted for all stamp series after 1945 will be exhibited; they are being graciously made available by the Generalpostdirektion. The public will have the opportunity to admire the artistic execution by experienced Austrian graphic designers and engravers. The state printing works will offer the visitors the object "The stamp as an article for export". Almost all the completed orders from Liechtenstein, Albania, Bulgaria, Iceland, Luxemburg. Montenegro, Norway, Persia, Sweden, Siam, Turkey etc. will be exhibited. Among the numerous other exhibits we find: From a specialized collection of the 1850 issue Lombardy Venetia; Austria 1850-1947, an extensive collection of USSR, classic stamps on cover, Bosnia with all its varieties, Confederate States of America, partisan mail. Further a nice diligent work by a 13-year old student who calls her exhibit "An animal stamp lexicon". For a change, artists have brought several tableaus such as "humour in philately", and "the laughing postage stamp". The 20th anniversary of the Austrian stamp dealers association was being honoured by two publicity booths being made available. 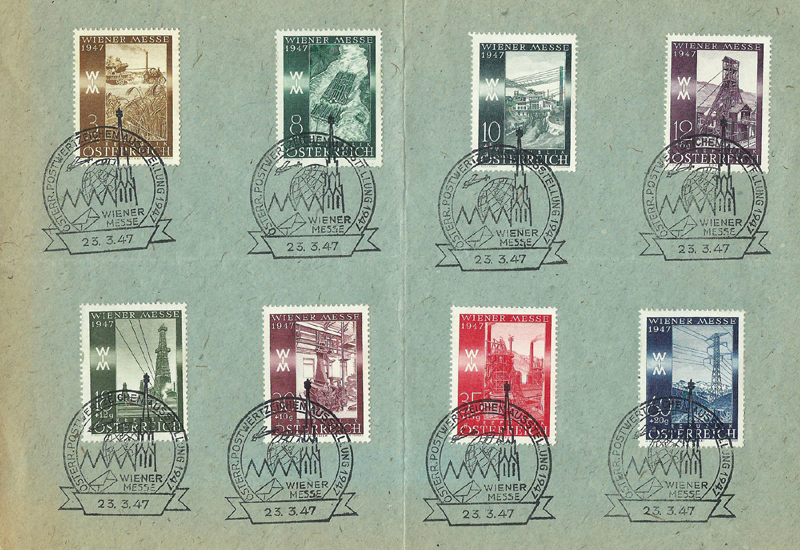 At the special post office in the exhibition, the set of 8 for the Messe is issued. Webmaster comments: Not a word about special cancels! It's interesting how they fitted stamps printed in Vienna into the notion of a Fair - they are an article of export! Well, they are exports to the country that ordered them to be designed/printed. What that country does with them is a separate problem. The purpose of an international fair is to sell things to other countries.